Because I thought Starcrossed was pretty freaking awesome, that's why! Ohhhh what a great choice! 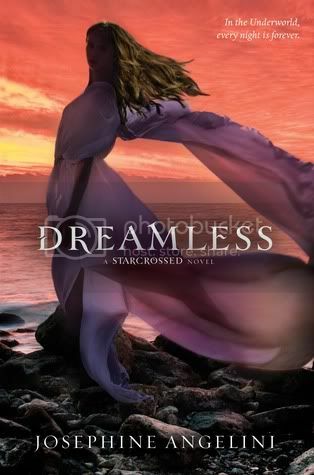 I loooooved Starcrossed and I can't wait to read Dreamless! Totally agreeing with you; I'll need a copy of this as soon as possible. :) Great pick! This is not helping my need for this book! So can't wait for that one either! Almost used that as my WoW today but went with another! I love the covers of these books. I am so excited to read this. SO EXCITED. I can not wait to find out more about Lucas and Helen. I thought Starcrossed was pretty freaking awesome too! Definitely waiting for Dreamless! I still need to read Starcrossed, but this has made me move it up on the list. Thanks for sharing! That is definitely a stunning cover! I really liked Starcrossed, too! I can't wait for this one to come out! I've been wondering inside my school library and always pass by starcrossed. Maybe I'll go pick that up now to get ready for Dreamless.